On 27 March at 8:30pm, Crowne Plaza Bucharest will be participating in WWF Romania’s “Earth Hour” by switching off lights, setting up candles, and offering every customer an “Earth Hour Green Cocktail”. Crowne Plaza, recently earned a European Eco label recognizing the green features of their property. The RoGBC strongly supports this initiative and thanks Crowne Plaza for joining the effort! Paul King and his team at the UKGBC have been doing amazing work in working with their government to ensure sustainable construction policy is forward looking and environmentally and economically sustainable. group of the World Green Building Council, successful examples from national green building policy, and what is ahead for the business and building community as we head into a Post-Copenhagen implementation of international climate agreements. Anca, and I attended the World GBC strategy meetings and had a chance to interact with other leaders of Green Building Councils throughout the world and shared our opinions on what are the best policies for Romania and the surrounding region. 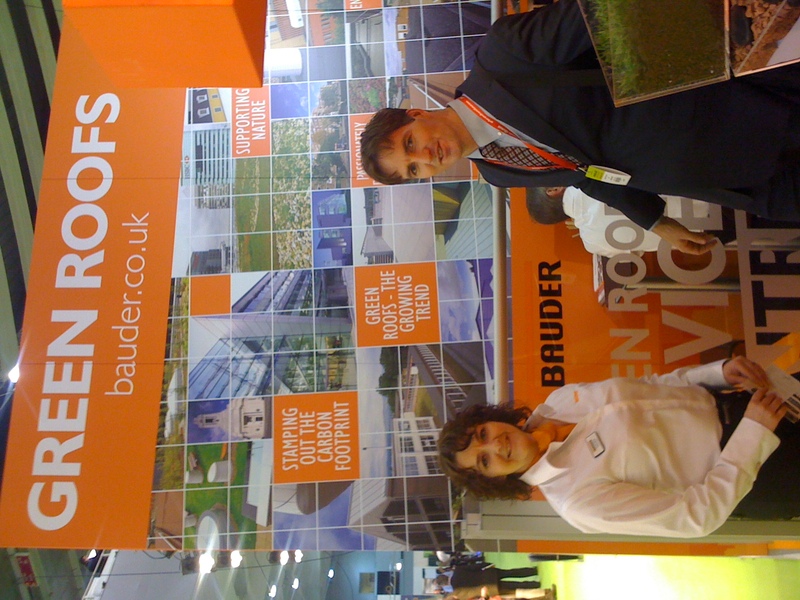 Cristina joined us to tour the EcoBuild exhibition occurring that same week. It was amazing to see the growth from just a couple of years ago when we first attended the event. I think Paul’s comments summarizing the event best describe it. We are confident this is a sign green building interest will continue its strong growth in Romania and the region. Despite dedicated attendees fighting a March blizzard, we had a very successful launch of the Green Building Innovation Center in Bucharest. The attendees were welcomed by Adrian Cristescu, Principal of West Group Architecture, responsible for hosting and design of the center. Steven Borncamp, RoGBC and Adrian Cristescu of West Group Architecture present the launch of the "Green Building Innovation Center"
Eco-Entrepreneurs and more established businesses including Naturalpaint, Katja Perrey Landscapes, Stardome, Jetrun, and Equram attended as well as the Executive Director of the Romania Association of Facilities Managers and journalist and editors from Ziarul Financiar, Wall-Street.ro, and The Diplomat. Steven Borncamp, Bogdan Draganescu and Florin Dobrescu represented the RoGBC’s Board of Directors. A business plan contest for entrepreneurial companies interested in locating in the center was launched with prizes awarded to the winners each valued at over 5000 Euros. These include prizes of a free annual RoGBC membership, six months of free rent in the fully serviced office, and free enrollment in the Romania Green Building Professional training and certification program. Interested persons should download this document: Green Building Innovation Center – Information for more details.